The brightest images exclusive multi-coating technology reduces most of the light refraction, allowing more light through the loupes and providing the brightest image possible. Superior depth of field with extended working distance range, the area magnified will remain clear and sharp. One step papillary adjustment the papillary distance can be adjusted by one center axis. It is very convenient and exactness for you. Adjustable angular viewing the viewing angular can be adjusted by yourself. 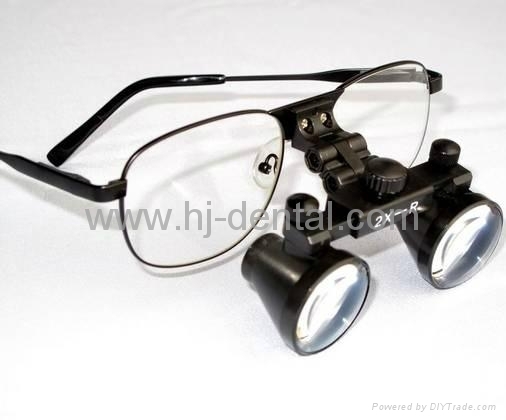 The binocular loupes are designed specifically for dental hygienists and dental Assistants, Physicians, Surgeons, Medical student and other health Care Professionals. Also they are widely used in the electronically industry, precise manufacture, textile facture and Researcher, Engineer who require the precise observation in Optical Magnification.